On 30th September 2014, they were elected into office in Warri as the Executive Committee of Nigeria Football Federation. On 30th September 2017, celebration in the house of a principal figure in the Committee in Lagos brought them together in an atmosphere of panache, warmth and laughter. 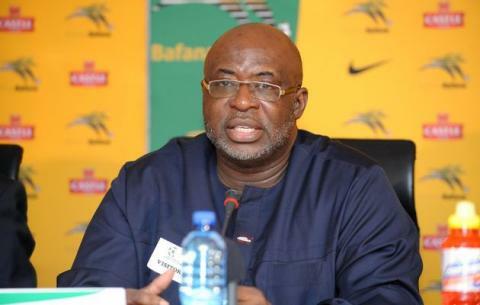 NFF 1st Vice President, Barr. Seyi Akinwunmi on Saturday gave out his daughter, Adebanke in marriage to Soromfechukwu Uzomah, at a gorgeous ceremony in Lagos. The day kicked off with the traditional wedding followed by the church service at Trinity House and a memorable reception at The Dorchester, close by Trinity House on Victoria Island, Lagos. The Nigerian Football fraternity was fully represented. NFF President Amaju Pinnick, 2nd Vice President/LMC chairman Shehu Dikko, Executive Committee members Ibrahim Musa Gusau, Sunday Dele-Ajayi, Yusuf Ahmed ‘Fresh’, Chidi Ofo Okenwa, Sharif Rabiu Inuwa, Musa Duhu, Mohammed Alkali and Aisha Falode, LMC CEO Nduka Irabor and NFF Deputy General Secretary Emmanuel Ikpeme were joined by Communications and Protocol Directors Ademola Olajire and Tunde Aderibigbe. There were also Chairman of the Lagos State Sports Commission, Mr. Ayodeji Tinubu (a former Member of the NFF Board), Members of Ogun State and Lagos State Executive Councils, former NFF Board Members Taiwo Ogunjobi and Ahmad Kawu, former NFF General Secretary Bolaji Ojo-Oba, Chairman of Club Owners Isaac Danladi, his secretary Jude Anyadufu, former Lagos State Director of Sports Kweku Tandoh, Radio Brila CEO Larry Izamoje, Members of the Lagos FA Board, Players’ Union scribe Austin Popo, foremost sports journalists and other football stakeholders. In three years, Pinnick’s Board has won six major trophies, including the FIFA U17 World Cup, two Women AFCON titles and the Africa U23 and Africa U20 men titles, plus Olympic men’s football bronze. There have also been capacity building programs for referees, coaches and administrators, extensive support for FIFA and CAF –sanctioned coaching license and referee courses, credible partnership agreements with leading corporates and a ringing voice and presence for Nigeria in international football politics. Failure to qualify for successive AFCON finals in 2015 and 2017 and the U20 and U17 AFCON this year have been hard punches on the field of play, but Pinnick insists the Board’s vision of building a sustainable football culture and hard focus on youth development remain unshaken. Election into the CAF Executive Committee, preceeded by appointment into the influential Organizing Committee for FIFA Competitions and followed by appointments into the CAF Emergency Committee and as President of AFCON, have amounted to a meteoric rise that has made Pinnick the highest –placed Nigerian football official in history. Yet, the former Executive Chairman of Delta State Sports Commission told thenff.com that the Board is not rolling out the drums yet, but working hard to ensure no stone is left unturned for eventual victory in Saturday’s all –important 2018 FIFA World Cup qualifying showdown between the Super Eagles and Zambia’s Chipolopolo in Uyo. A win will see Nigeria book a ticket to football’s greatest showpiece in Russia next year summer.